The 3021 USB reader from Omnikey (previously the CardMan CM3021) is the latest addition to their range, offering the very latest technology in a consumer-style transparent housing with a blue LED. This reader is fully PC/SC compliant and supports all ISO 7816 microprocessor-based smartcards. 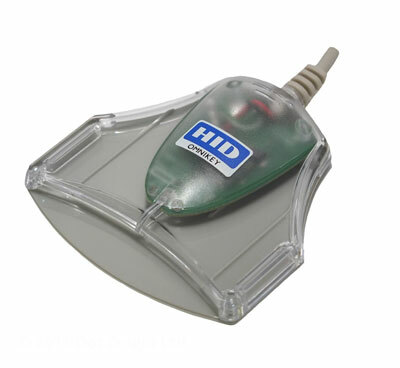 It also meets USB 2.0 and CCID specifications for simple driver installation. The reader comes complete with WHQL approved Windows drivers, and is ideal for consumer smartcard applications. The CardMan 3021 uses the same technology as Omnikey's leading CardMan 3121 reader and boasts both great performance and quality. Standard PC/SC drivers for Windows 98, ME, NT, 2000 and XP with every product. We also offer Linux and Mac OS X drivers for the 3021. Synchronous API drivers are also available for many of the same operating systems from the Omnikey website. Drivers PC/SC for Windows 98, NT, Me, 2K, XP, Windows Server 2003, Windows Vista 32 & 64bit & Windows CE.